How to make kettle corn at home (easy & tastes great) | ...and another cup of coffee. Summer begins and you find yourself wandering to different outdoor events and that kettle corn is just flagging you down? My daughter thinks that the only reason for her to go to a farmers market is to go get some kettle corn, go home, pull out a few barbies and call it great weekend. I’ve been searching for recipes on how to make this magical but simple snack at home. I finally found one that uses coconut oil instead of regular oil. I had a jar of it, that I still hadn’t opened, in my pantry from Trader Joe’s (love that place) and decided to give it a shot. So first melt about 3 tbsp of coconut oil in the pot on high heat the stir in 2-3 tbsp of sugar. 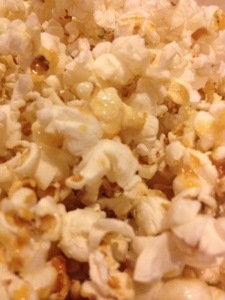 When the sugar is mostly dissolved, throw in 1/3 to 1/2 cup of popcorn kernels. Cover Immediately! Let the kernels heat up a little, shaking the pot a little now and then. Once they begin popping shake the pot continuously. Once the popping slows, turn off the burner. Shake the pot a little more to help any kernels remaining pop open. Toss the popcorn with some salt (if desired) and it’s ready to eat!